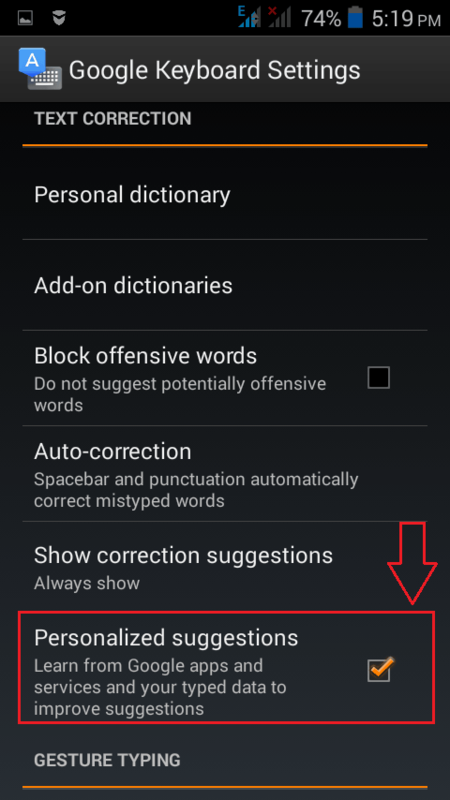 How to turn off auto correction feature in Android:- You type in eating and your phone takes it that you meant taking. Before you have a chance to think what your phone thinks of you, you hit Enter key and taking instead of eating is in the air, seconds away from delivery. 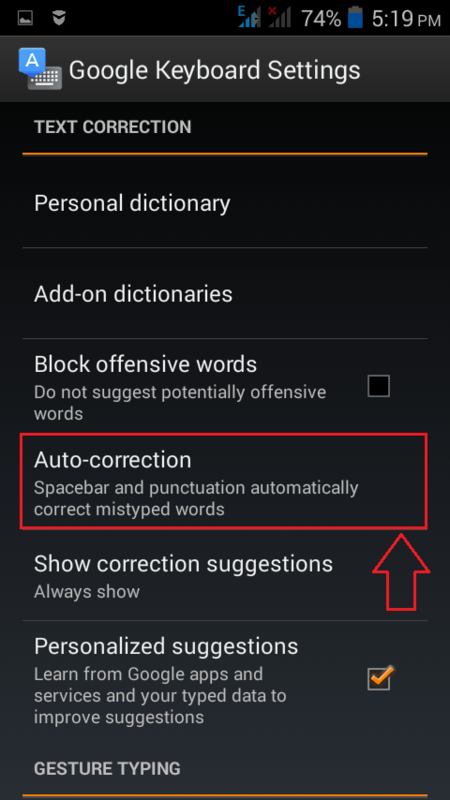 We all have had our funny moments with auto correct feature in our android phones. But if its with someone superior or elder that we are chatting with, auto correct is the last thing we want our lives to be messed up with. Often we end up in a failed search for changing auto correct settings. Don’t worry we have the perfect solution for you, right here. Launch Settings first. 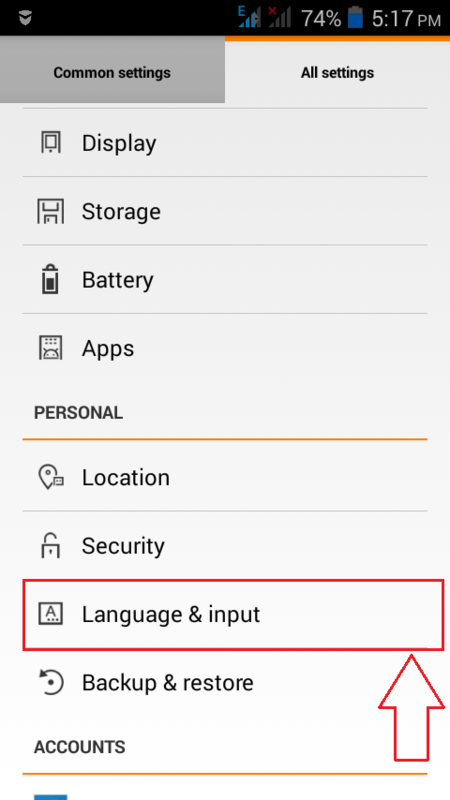 Find and click on the option named Language and input. 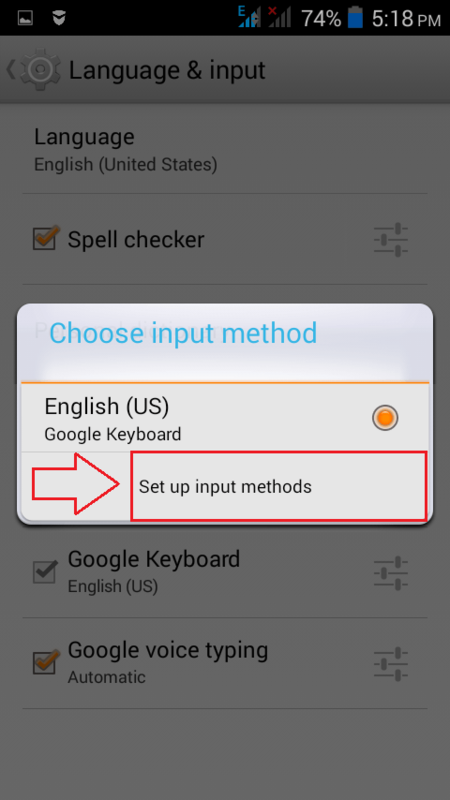 Under the Language and input section, look for an option named KEYBOARD AND INPUT METHODS. Click on Default as shown in the screenshot. Now a pop up alert comes up.Click on Set up input methods to change the keyboard settings. Click on the Settings icon associated with the default keyboard. In the given example, it is Google Keyboard. 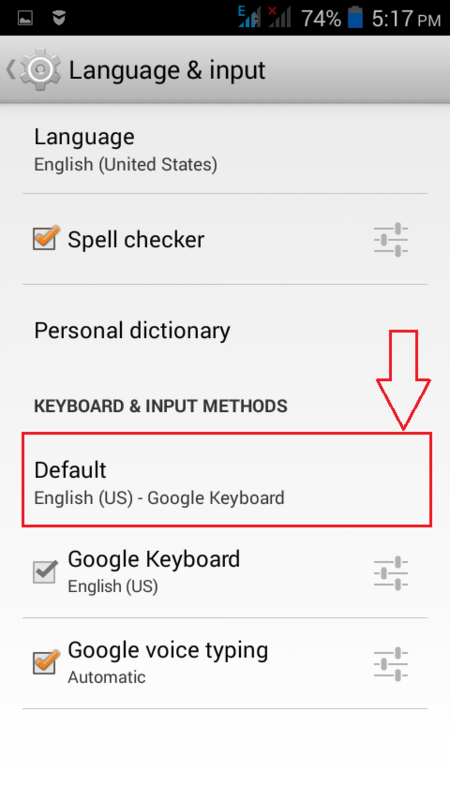 A new screen to change Google Keyboard Settings opens up. Scroll down to find the section named TEXT CORRECTION. 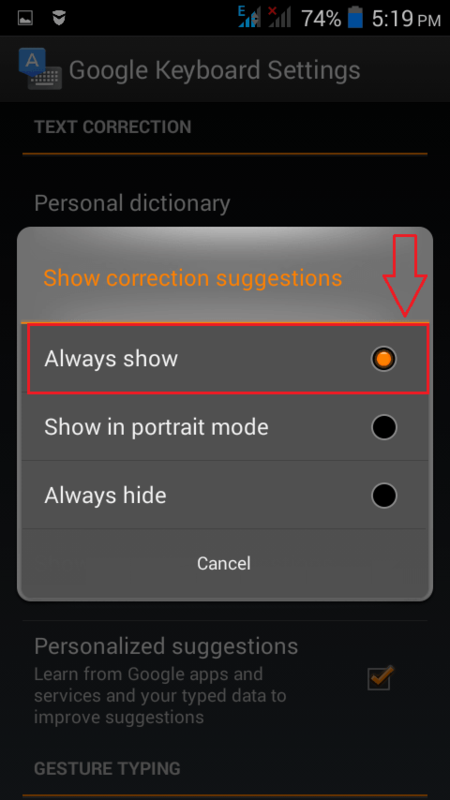 Now you need to click on the option named Auto-correction as shown in the screenshot. You can check the radio button as per your preference. 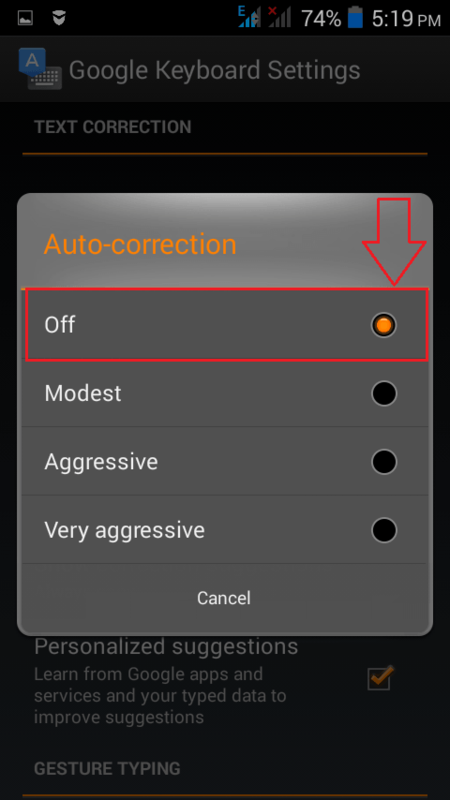 You can turn off the Auto-correction feature altogether or you can set it to a modest level, or at an aggressive level or at a very aggressive level. In the following screenshot, I have chosen to completely turn it off. That’s it. You will no longer be bothered with unwanted auto corrections. You also have the option to decide whether or not the correction suggestions be shown to you. Click on the option Show correction suggestions to change its settings. If you want Google keyboard to help you with your typing, you can check the radio button corresponding to Always show. You also have other options like Show in portrait mode and Always hide to choose from. Google can track what you type and based on what it tracks, it can give you personalized suggestions. So if you are someone who uses Hey a lot, the moment you type h, Google can give you hey as a suggestion to you. If you want this feature, you can check the checkbox corresponding to Personalized suggestions as shown in the screenshot. You can manage the auto-correction and related settings in your android phone just like that. Hope you found the article useful.